Keeping a journal is like having a personal confidant and a place to confess fears without judgment. Journaling has been a form of expression for me for a long time, just as painting is a form of expression for an artist. It reveals the truth of how I perceive the world at any given time, whether rational or not. The world seems clearer after I write down my scattered thoughts, and it helps me cope with the realities of my life. Journaling is a way to clarity and recovery. I have an assortment of journals, from fancy ones, to cute ones, to spiral notebooks, to ones given to me by friends, who know I journal. They are all over the place – in my closet, cedar chest, desk, up in Telluride, and scattered around, just like my thoughts are when I sit down to write. There is a concept in Buddhism called “Emptiness” or “Great Void”, where one observes their thoughts and things with no opinion about them one way or another – it’s emptying one’s mind of judgment and labels – that is, of course, a very simplified explanation. It’s a difficult place to get to for anyone, but journaling has helped me to slow down my thoughts, and see things for what they are. It could be called a form of meditation. Journaling is a spiritual tool that stops my fear of any moment devoid of productive activity. I found clarity on my written pages many times, as I let the irrationality of my son’s addiction and my part in it, play out in them. Those pages allowed me to track the progressiveness of his disease, and showed me the need to educate myself about what was happening. Eventually, they revealed I had to change or I was going to lose myself in his addiction. I was letting his addiction ruin my life, and I needed help, too. I still keep a journal because it’s a way to explore my grief and encourage my creativity. The act of writing accesses the left brain, which is analytical and rational, and is where I feel the most comfortable. While the left brain is occupied, my right brain is free to create and feel. It works to remove blocks to my creativity. My type of journaling is called stream of conscious writing – no editing. It is three pages of longhand writing every morning and doesn’t follow any particular structure. I let the words flow freely without worrying about spelling mistakes, grammar, or what other people might think. It can also be called “brain drain”, since that is one of its main functions. I learned how to do this type of journaling, called Morning Pages, from Julia Cameron’s book “The Artist’s Way”. I have read her book so many times, it is dog-eared and coffee-stained. 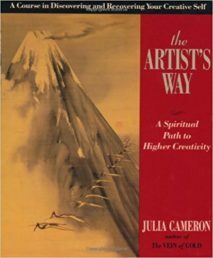 It is, in essence, a spiritual path practiced through creativity. It’s not just for artists, either, since I am not one. There are several computer software programs and mobile apps available for journaling, but they never work as well for me as longhand writing in a notebook. I guess I always feel like I need to have proper grammar and write perfect sentences with those programs, and it defeats the whole purpose of journaling, in my opinion, but I know people who use them. They claim it is a way to keep their journals private, with password protection, instead of having them strewn about like I do. Sometimes, I will journal in my Notes on my iPhone, if I feel an urge to write something down, when I don’t have a notebook nearby. Of all of the recovery tools I have used, journaling has been my most consistent. I am slowly working on a book/memoir, and I have well over 10 years’ worth of journals to look back on for my history and research. All of my negative feelings just came back. I had feelings of complete helplessness back then. No matter what I did or said, nothing changed. Now, I see how I was beginning to change, realizing I was wasting my life in worry. It is actually very profound for me to read after 5 years in my closet, knowing that I was trying hard to work on my own recovery. Back then, keeping a journal helped me establish order when my world felt like chaos. I still look forward to my journaling time, and am confident that I am doing something beneficial for my mind, body, and spirit, even though it’s different than before Cody died. My world isn’t filled with chaos anymore, but it is filled with loneliness and grief. Now, it helps me to find the good in my life, and I have plenty of it, despite the tragedy of losing my son. It must be another genetic predisposition……to scattered journals this time. Ha, ha. Mary, I think you could use an app called Writelight, it’s perfect for Morning pages-style journaling. You pick a topic, get a random prompt, set timer, and when the time is up there’s a cool quote, that can work as a second prompt. It’s very interesting.